Plan of Peekskill Westchester Co. N.Y.
A very attractive example of F. W. Beer's 1867 map of Peekskill, New York. 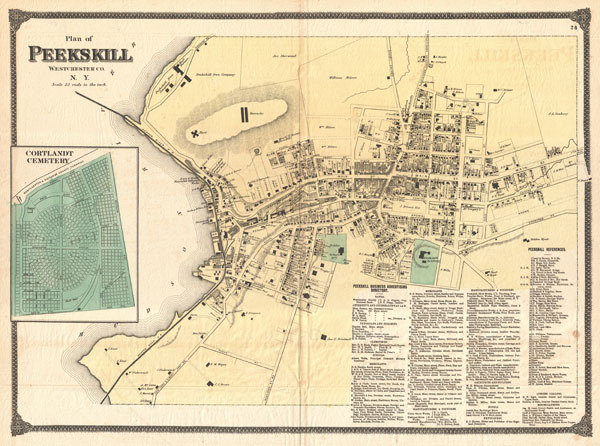 Details the town of Peekskill from the Hudson River to 'Five Mile Pike.' Offers extraordinary detail at the level of individual buildings. A treasure for genealogists, this map actually names the owners of individual homes and estates. A directory in the lower right hand quadrant notes all Banks, doctors, clergymen, schools, merchants, manufacturers, architects, builders, hotels, etc. An inset in at the right side of the map details Cortlandt Cemetery. Prepared from actual surveys by F. W. Beers for his 1867 Atlas of New York and Vicinity. Beers, F. W., Atlas of New York and Vicinity : from Actual Surveys, 1867. Very good. Original folds. Blank on verso.